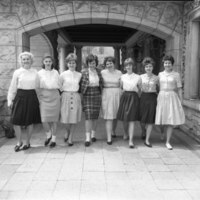 Listen as Jean Dolores Schmidt, BVM, faculty member, and administrator at Mundelein College, recalls the bold steps taken by students to abolish all formalized dress regulations. 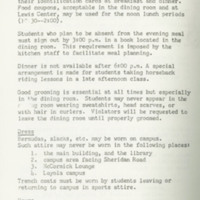 Dress Code for Mundelein students from the Resident Handbook, 1964-1965. Students sporting strict dress code attire, 1963. 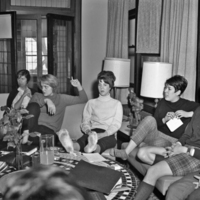 "Random survey of residents favors change in dress code," Skyscraper, May 17, 1968. 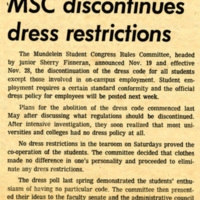 "MSC discontinues dress restrictions," Skyscraper, November 22, 1968. 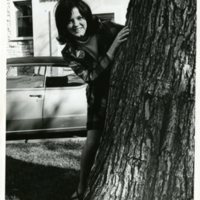 As the 1960s wore on, Mundelein students increasingly looked to change their own experiences as a way of bettering society. 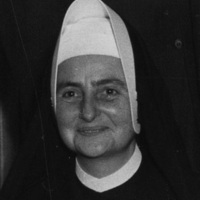 Perhaps influenced by Second Vatican Council and the ongoing sexual revolution, undergraduates saw their longstanding dress code as overly strict and conservative. 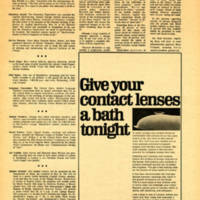 Once 1968 rolled around, co-eds took fearless action. They abandoned their confining skirts and sweater sets for blue jeans and sweatshirts without so much as a letter notifying the college administration.